Resembling a large screw, screw piles are installed deep into the ground, beneath the frost line, to solidly support the structure of your project. 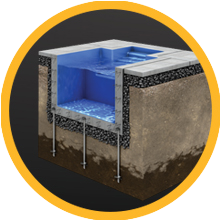 This is an advantageous alternative to form tubes and is less expensive than concrete foundations. Superior quality galvanized steel, worthy of the most ambitious projects. Our galvanizing process protects steel against corrosion to guarantee maximum product longevity. 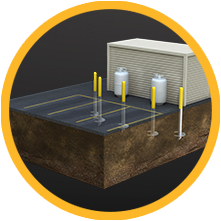 No matter the area where they are installed, GoliathTech piles remain in perfect condition for a very long time. It’s guaranteed! Fights frost and thawing soil movements on all fronts: inside-out. Piles designed to last. Guaranteed. 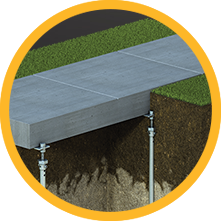 The GoliathConnect joint system allows a pile to be extended by joining two tubes using a locking bolt. 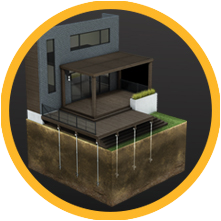 Contrary to the competition’s solution, this innovation strengthens long piles and eliminates risk of movement.